Our smallest metal tree guard. An economic and attractive way of protecting smaller saplings. Strong welded steel construction. The upright gaps are no greater than 9.4cms. Each iron tree guard is split able (scroll down the page for fitting instructions) for easy fitting to existing trees and re-use. All joins are stock friendly with no tabs for animals to catch themselves on. Supplied with three ground stakes that bolt to the tree guards for solid ground fixing and all nuts and bolts. With strong welded steel construction these metal tree guards provide decorative protection for saplings and smaller trees. The upright gaps are no greater than 9.4cms these steel tree guards are suitable for sheep & smaller stock animals. 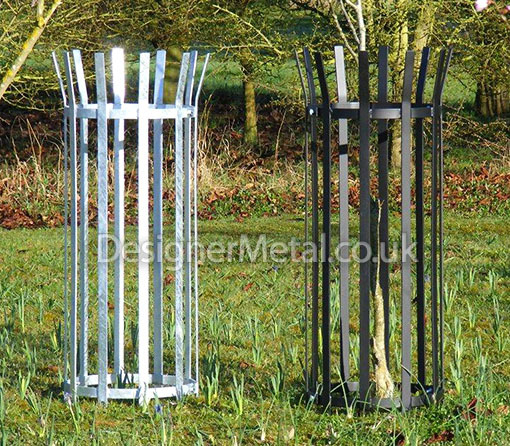 Each metal tree guard is split able (scroll down the page for fitting instructions) for easy fitting to existing trees and re-use. All joins are stock friendly with no tabs for animals to catch themselves on. Supplied with three ground stakes that bolt to the tree guards for solid ground fixing and all nuts and bolts. A slimmer, elegant and less costly version of this classic iron tree guard is perfect for farms, public & private parks and gardens. With welded steel construction they are perfect for newly planted trees with a small trunk. The upright gap spacing is no more than 9.4cms. All joins are stock friendly. Each metal tree guard is split able (scroll down page for fitting instructions) for fitting to existing trees and re-use. Supplied with all nuts and bolts and three ground stakes that bolt to the bottom ring for secure ground fixing. This classic iron tree guard is perfect for farms, public & private parks and gardens. With welded steel construction they are strong enough to withstand the rigours of horse & heavy stock. The upright gap spacing is no more than 9.4cms and suitable for sheep and small stock animals. All joins are stock friendly. Each metal tree guard is split able (scroll down page for fitting instructions) for fitting to existing trees and re-use. Supplied with all nuts and bolts and three ground stakes that bolt to the bottom ring for secure ground fixing. 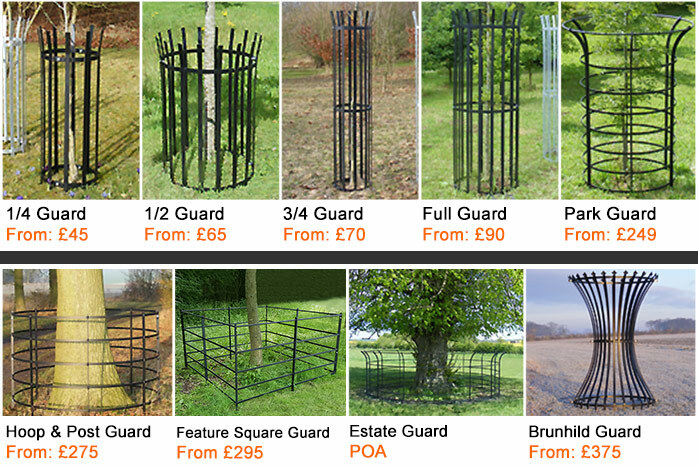 This iron tree guard is a taller, slimmer version of the Estate Guard and offers great protection against all stock. Although the trunk is slimmer the ring spacing is tighter. With a 20mm round solid top ring, 7 stock spaced 25x8mm rings, six 40x8mm posts, all fully welded, this metal tree guard is splitable for easy fitting, moving and re-use. It comes with 6 ground stakes that are hammered into the ground and bolt to the posts. Please scroll to the bottom of the page for fitting instructions. 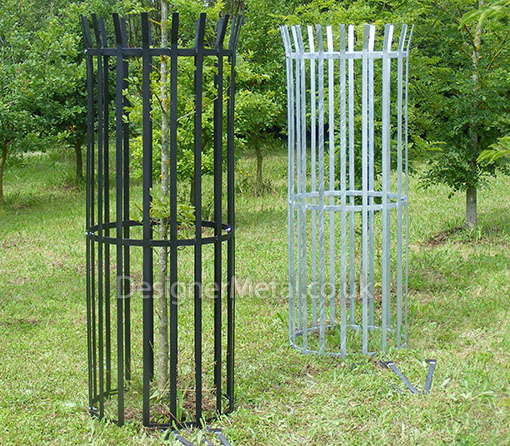 The Estate Guard is the largest pre-fabricated metal tree guard we do and offers great protection against heavy stock. 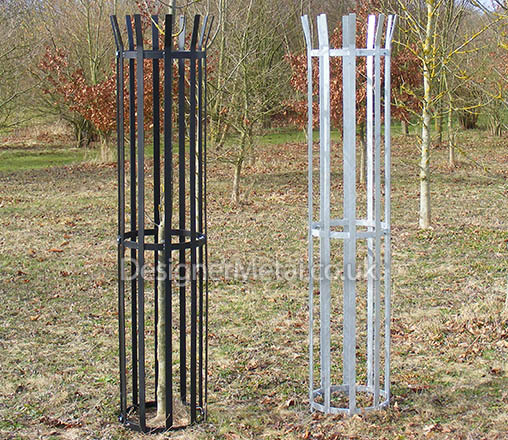 With a bigger 6ft footprint, a 20mm round solid top ring and 5 stock spaced 25x8mm rings( spaced to match out Estate Fencing), eight 40x8mm posts, all fully welded, this metal tree guard is splitable for easy fitting, moving and re-use. It comes with 8 2ft ground stakes that are hammered into the ground and bolt to the posts. Please scroll to the bottom of the page for fitting instructions. These simple, yet effective, square metal tree protectors come flat packed for easy installation. Ideal for keeping stock, large & small, well away from trees. A terrific feature and the ultimate in tree protection against horse, cattle, sheep and all small and heavy stock. 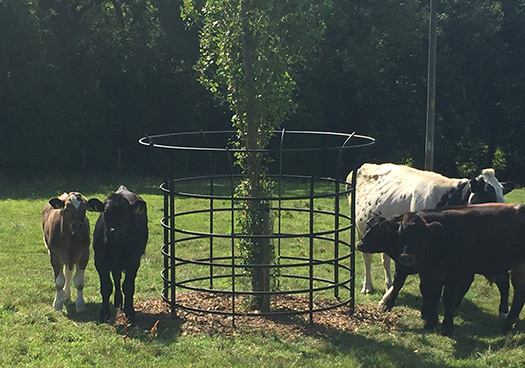 Standing 160cms (5ft3″) tall, these livestock tree guards boast a 20mm solid top ring, 5 stock spaced 25x8mm rings (spaced to match our Estate Fencing), 40x8mm posts, all fully welded and painted on site, this iron tree guard can be made large enough to prevent animals reaching your trees and strong enough to withstand rubbing. These metal guards are fabricated by our team on site and can be made to any diameter/circumference. Currently the most elegant of our tree guard range. Standing a little over 6 ft (185cm) tall with a top and bottom ring circumference of 4 ft approx (115 cm) and a 2 ft approx (60 cm) waist, she is perfect protection for new and established trees. Weighing 70 kgs and supplied with four iron stays for fixing. Unpainted rust finish: Structurally these tree protectors will never corrode away in any customer life time. Within 6 months they will be a lovely organic rusty brown, very much in vogue, beautifully blending into a country environment and completely maintenance free. Painted: A tough hard wearing satin black, high Zinc based, primer/top coat. Also available in a specified RAL colour (colours other than black will affect published price). Galvanized: Hot dip galvanized tree guards. Maintenance free. Galvanized and Painted: Hot dipped galvanized, acid etch primed and then given a tough hard wearing satin black, high Zinc based, primer/top coat. Also available in a specified RAL colour (colours other than black will affect published price). Bolt the 2 halves of your tree guards together around your tree. Once in place align a stay with one of the bolt holes in the base of the tree guard and bang into the ground, bolt to the tree guard and repeat until all three stays are in place. Bolt the 2 halves of your tree guard together around your tree. Stamp legs into the ground an inch or so. Split tree guard and remove. Bang a stay into each of the indents made by the legs and using a laser or spirit level make sure all the 8 stays are the same height then replace your tree guard and bolt to stays.